The Pololu Zumo is a small mini-sumo sized robot. 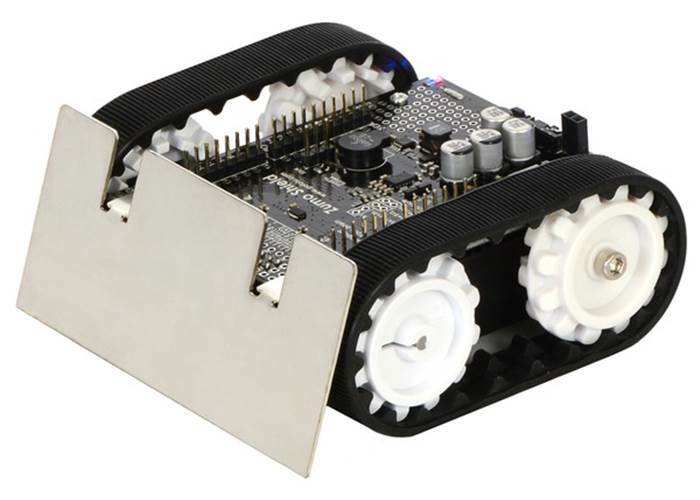 It is a high quality tracked robot platform that is great fun for learning robotics. It comes in a number of variations including kit form and fully assembled. The first version of the Zumo came with the V1.0 of the Zumo Shield for Arduino. Pololu soon revised the shield to the V1.2 Zumo Shield but otherwise the robot stayed the same and is available as the Pololu Zumo robot for Arduino V.2. The changes to the shield were relatively minor improvements to the accelerometer and an added gyro. Pololu have also released another version of the Zumo that is based on the ATmega32U4 chip called the Pololu Zumo 32U4 robot which has more features but is more expensive. The Zumo Arduino robot requires an Arduino Uno compatible micro-controller which is sold separately. This robot is a great option if you already have one of these boards lying around waiting for a fun project to happen to it. Good controllers are the Arduino Uno R3, Leonardo or SparkFun’s Redboard. If you like building things and can do a little bit of soldering then the kit is the place to start. 100:1 micro metal gearmotor. More torque, slower speed but stronger robot. 75:1 micro metal gearmotor. Balance of speed and torque. 50:1 micro metal gearmotor. Less torque but faster and more agile robot. Higher gear ratios like 210:1 tend to make the robot a bit slow while ratios like 30:1 don’t quite give enough grunt on surfaces like shaggy carpet. 1 x Arduino Uno compatiable microcontroller. Arduino Uno R3, Leonardo or SparkFun’s Redboard are great well made choices. 1 x USB cable. The type depends on your microcontroller. ‘A’ on one end and either mini-B or micro-B for the microcontroller. 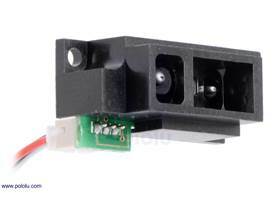 These are very common for cameras and phones. AA batteries. The Zumo takes 4 AA batteries. It will run for several hours continously on a set of quality alkaline cells or better still use rechargeable NiMh as they are cheaper over the long run. Both available in most supermarkets and larger hardware stores. The best instructions to follow for putting together the Zumo kit are detailed here, covering soldering and assembly of the motors and other parts to the shield. These instructions are worth following as it saves time undoing mistakes like the ones I made. If putting together a Zumo 1.2 from scratch is not your thing, you can start with an assembled robot and add your own controller. 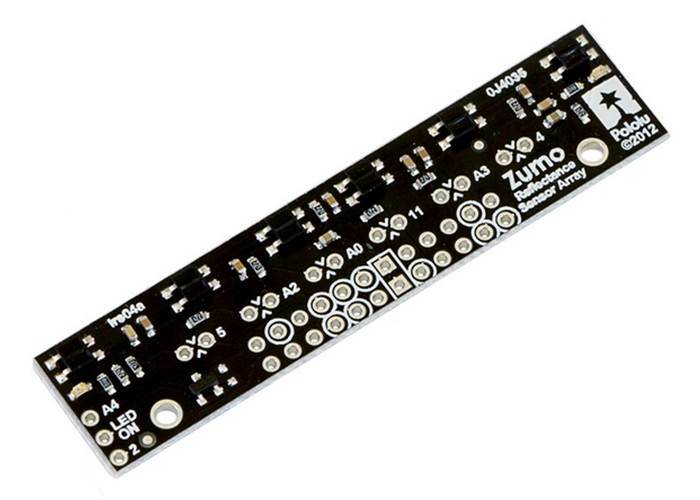 The Zumo for Arduino can be fitted with an infrared line sensor “Zumo Reflectance Sensor Array”. This enables the robot to follow lines and solve maze puzzles. It is a great addition that adds lots of possibilities to the robot. It works with both V1 and V1.2 of the Zumo Robot for Arduino, assembled or kit form. The V1.2 Zumo Shield breaks out a lot of the pins from the arduino based microcontroller. Sharp distance sensors These come in all kinds of ranges and are either analog (give a distance reading) or digital (true/false) detection. These work great indoors and can detect other robots or walls, chairs etc. Ultrasonic range finders use reflected sound waves these sensors measure the distance to an object. The would well in bright light and have a wider detection area than infrared sensors. Common ones for little robots include the SRF02, SRF05 however a wide variety exist with difference response characteristics and detection ranges. Your robot could use a photocell resistor to detect light and scurry away or attack or bling it up with some LED lights. Remember the V1.2 Zumo Shield comes with a 3-axis accelerometer, compass, gyroscope!